San Diego County offers no shortage of things to do. Starting with its iconic oceanfront, ever-abundant daily doses of sun and incredible year-round weather, art galleries, concert halls, performance art theaters, running, hiking and bike trails. That list goes on. And did I mention amazing year-round weather? Less people, though, may think history mecca when they think of San Diego. But So, a quick dose of reality is in order. That is, San Diego County is home to over 200 sites registered by the California Historical Resources Board as historically significant, as well as home to 140 sites listed as such by the National Register of Historic Places, which is overseen by the National Park Service. History, of course, grounds you in the community in which you live and history-centric tourism of any sort can be a deeply meaningful experience. Historical exploration, too, often comes for free or on the cheap, and can often be done in tandem with other things you’ve already got planned for the day when you’re out and about. It’s easier to do that sort of thing when you’ve got a handy map, which is why we’ve created one for you! Consider this a guide to bookmark and turn to anytime you’re out and about and looking for a historical sojourn for 30 minutes, an hour or a few hours. We’ve chosen sites which you may not necessarily see in your local tourism guides, though clearly not due to them not being of historic significance, hence them making these lists. While museums often serve as repositories of history, so too is your own community, often hidden right in plain sight. Hopefully, we’ve done our job successfully, then, and this guide can serve as a launching point to make some of that history more visible in San Diego County. The Thomas House is the oldest existing house in Escondido, built in 1886, and is the historic home of one of the founding fathers of the city. While currently maintained as a private residence, if you’re in the area, take a walk around the block and check out this relic of prime historical importance for the history of Escondido. California is known by many as the final frontier of the Gold Rush, with a football team in San Francisco even named after it. The Robinson Hotel is the Gold Rush embodied in the form of a hotel, a place where gold prospectors lodged while hoping to, well, strike gold. Established in 1897, what today is known as the Julian Gold Rush Hotel was then known as the Robinson Hotel. It was one of the first businesses in San Diego County to be operated by African-Americans, Albert Robinson and Margaret Tull Robinson. The hotel has 16 rooms and now serves as a bed and breakfast. While there, it might be worth taking a trip to see the grave of Mr. Robinson, as well. The Magee House is a worthwhile stop on Highway 101 in Carlsbad for those who are interested in the area’s history and gardening. Built in 1887 by Samuel Church Smith (one of the founders of Carlsbad Land and Water Company), the craftsman-style house is made of pre-cut lumber, ordered from a mid-Western catalog of pre-designed homes. It’s now home to the Carlsbad Historical Society’s museum and archives and open to the public. The gardens surrounding the home are designed to demonstrate Carlsbad’s agricultural past including a Victorian Herb bed, a native Southern Californian bed, a Carlsbad commercial growers bed, a Patriotic Red, White and Blue bed and a nationally-registered Rose Garden. The latter includes about 225 rose bushes representing 15 families of rose. The rose gardens have been cultivated to reflect Carlsbad’s 2002 title of “An American Rose City”. One garden is modern roses and the other garden contains Old Garden roses and shrubs. A new miniature rose garden was planted in 2003. This magical garden is maintained by the members of the California Coastal Rose Society and established by Ivy Bodin of Vista but the rest of the gardens are maintained through the combined volunteer efforts and city staff. The museum portion houses turn of the century style furniture and other items on display that reflect the lifestyle of the early settlers of Carlsbad who once owned the house. When the home’s owner, Florence Shipley Magee died in 1974, she left the house and land (about 5 acres)–located just a block away from the beach–to the City of Carlsbad. She wished it to be used as a park and historical museum, which is exactly what happened. The home was recently refreshed with new paint and other touch-ups and remains one of the oldest in the area. Guided tours of the museum and grounds are available with advance notice. The Carlsbad Historical Society has also developed a special tour for local third graders to learn about the city’s history on the grounds. December is a particularly popular time to visit as volunteers decorate the home for the holidays using native plant material–just like the early Carlsbad settlers did. Support the Carlsbad Historical Society by visiting the Magee House or by becoming a member (a family membership is just $35 a year) which entitles you to attend the society’s lectures, social events, trips, and tours for its members as well as local students while supporting their overall efforts. The Carlsbad Santa Fe Depot helped put the city on the map in Southern California and served as a key rail industry hub in the city’s formative years, but also played a role beyond that as a center of city activity, too. It opened to the public in 1887. 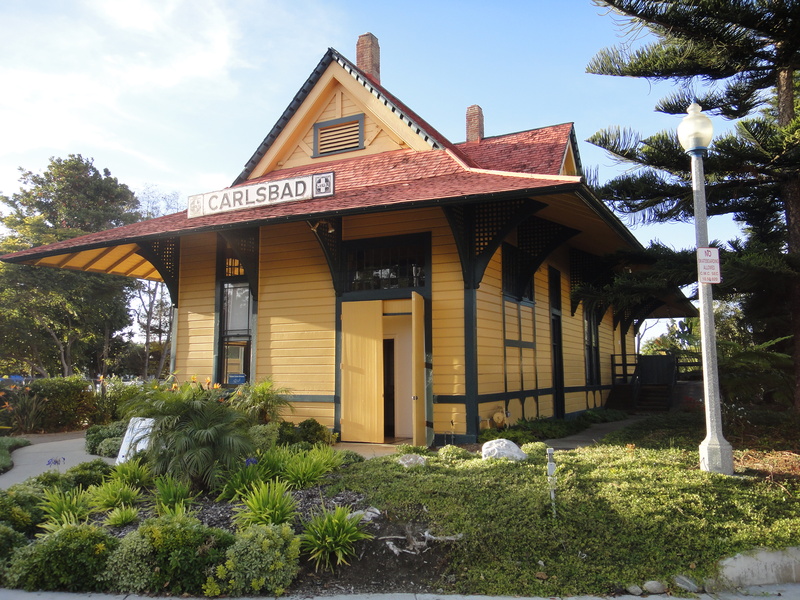 Though it no longer serves as a rail hub, it still serves as a railroad to the past, without which Carlsbad as we know it today may not exist. Mule Hill is the physical site of the final battle of the Battle of San Pascual, which was a pivotal and the bloodiest battle of the U.S.-Mexico War. With immigration and what to do about the issue a perpetual debate in U.S. political discourse, the Americanization School in Oceanside serves as a dose of history which connects to an ongoing historical debate both in San Diego County, but also more broadly in U.S. society. Constructed by renowned architect Irving Gill, the Americanization School was launched during a time of great change in the U.S. during the “Roaring 20’s,” with immigration and — in the case of the Americanization School — the role of assimilation, a burning issue in San Diego County at the time. Teaching recently-arrived Mexican-Americans U.S. culture and language, English, were key priorities of the school. Today, what was the Americanization School now still serves as a community center, in this case as the Crown Heights Community Resource Center, where history is repeating itself, at least in one way. That’s because among its offerings are English As A Second Language Classes. Registered simply as “The Castle” by the National Register of Historic Places, the name begs the rhetorical question with an obvious answer: who the heck wouldn’t want to go to a castle? Well, here’s your chance! Now a popular wedding venue and luxury hotel, at its dawn Mt. Woodson Castle served as an ostentatious private home of dress-maker Amy Strong completed in 1921. At 27-rooms, the place is huge, sitting on 320 acres of land (unheard of in San Diego County today! ), featuring architectural designs in both the interior and on the exterior of inspired by places and themes the world over. “The Castle represents a unique architectural and artistic expression: a copy of a fourteenth century sundial on the ceiling of the smaller living room, a dutch oven besides the large fireplace in the large living room, a great deal of subdued decoration on the ceiling of the large living room and arched entry, including Indian carvings to ward off evil spirits, are successfully combined in this fantasy dwelling,” explains the National Register of Historic Places for the mansion. Curious to see what it looks like, but not quite yet ready to commit to giving the place a look in-person? Take a virtual tour to help you settle that question. A glance at Brick Row and you’ll feel more like you’re visiting a historic building in the midwest or east coast, rather than in the far west. That’s because Frank Kimball envisioned Brick Row as a locale for which to attract railroad industry businessmen from the east coast in his dream to develop National City, San Diego County’s second oldest city, into a key national rail hub. With Brick Row’s construction in 1887, Kimball intended, for those familiar with east coast architecture, to live in these brick-constructed row house style townhouses. These townhouses prevail in cities such as Philadelphia, Chicago and Boston. San Diego County? Not so much. But they exist in National City, so come check them out and, while you’re there, take a broader stroll through National City’s Heritage Square. This is a monument impossible to see unless you head to Friendship Park, situated in the area between the U.S.-Mexico border, and it’s far more visible on the Mexico side of the border than it is on the U.S. side of it. But it’s worth checking out, as it’s the site designated as the initial boundary point on the U.S.-Mexico border’s western-most portion, created in the aftermath of the signing of the Treaty of Guadalupe Hidalgo. This still-functioning downtown San Diego postal office is a relic of the New Deal Era, opening for delivery in 1938. The famed architect William Templeton Johnson, who also has designed many other San Diego historic properties, served as lead designer of the post office. By their very nature, courthouses are centers of historical importance, where precedent-setting cases are decided upon which can – at times – reshape the entire structure of a society. While the U.S. Supreme Court in Washington, D.C. gets all the glory, only a relatively few cases make it that far in the federal court system. Most cases don’t make it beyond the District Court- or Appeals Court-level, which is what makes the historical U.S. Courthouse in San Diego of significance. “Of significance is the skillful blending of the classical and Spanish Colonial revival styles, the latter seen in the towers, arched openings, deep reveals, tile roofs and other Mediterranean style features,” the Register of Historic Places entry details. The building still stands today, now serving as the U.S. Bankruptcy Court for the U.S. District Court’s Southern District of California. Given that court cases are open to the public free of charge, if you’re interested in scoping out some cool historic architecture at the venue, head on over and give it a look. The Horton Grand Hotel, which opened for business in 1886, is one of those places you can’t miss if you’re paying attention and walking or driving around in downtown San Diego. While currently still a hotel and one which happens to be the oldest existing one in San Diego, it also features a theater and a restaurant/bar named Salt & Whiskey. According to its website, baseball legend Babe Ruth spent some time at the Horton Grand Hotel. You can’t really do historic tourism in San Diego County without checking out its historic Catholic mission sites. The biggest of them is Mission San Luis Rey de Francia, built in 1815 and named after Louis IX of France, who was the mission’s patron. 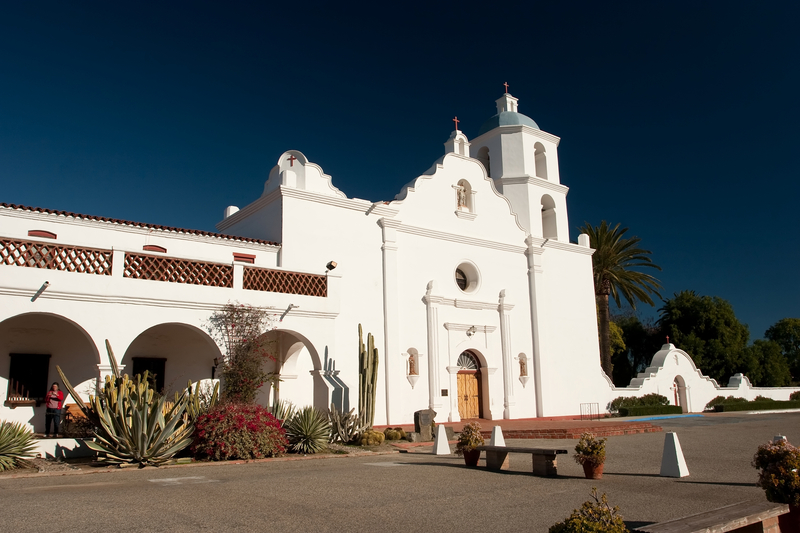 While you’re at it, also check out Mission Basilica San Diego de Alcala, located near SDCCU Stadium. Located about as far southeast as you can get in San Diego County, the Tecate Port of Entry is important because it’s a bridge between the U.S.-Mexico border and also a bridge back to the history of immigration in San Diego and California more broadly. Think of it as San Diego County’s version of Ellis Island, a place through which those looking to immigrate to the U.S. must first pass before advancing any further. This port of entry, historically crucial for both Mexican and Chinese immigration into the U.S., was created as part of President Franklin Delano Roosevelt’s New Deal initiative. Constructed in 1933 in the Spanish Colonial Revival style reminiscent of many of the buildings dotting San Diego County, Tecate is a name many known best for its beer, which is brewed in Mexico in Baja California. Only about 200 people now live in Tecate on the U.S. side of the border, while over 64,000 live on the Mexico side of the border. A hidden gem in the heart of downtown San Diego, the Santa Fe Depot serves as the southern most stop on the Amtrak Pacific Surfliner line, which runs from San Diego to Los Angeles, and vice versa. Located just blocks from the San Diego Harbor, the train station has served as the epicenter of transportation into and out of downtown San Diego since 1915, the same year that the Panama–California Exposition was hosted in San Diego in what became Balboa Park. Besides, who wants to drive when you can take the train?! The station also serves as a stop on the Coaster train line, which has many stops all the way up to Oceanside. While not exactly known as the Bible Belt, religion has played a vital role in the history of San Diego, not least of which is the history of its Catholic missions which founded the city and indeed the state of California. But the missions aren’t the only sites of seminal historic nature in San Diego County. Enter: St. Matthew’s Episcopal Church, located in National City, which opened its doors in 1887. National City’s founding father, Frank Kimball, served as one of the congregation’s founders back when it was known as the Episcopal Society and deeded the land which became the property that for now over 130 years has served as St. Matthew’s. It is one of the oldest Protestant churches still standing in San Diego County. Located on Mount Ecclesia, The Rosicrucian Fellowship Temple (also known as The Ecclesia) sits high on a mesa overlooking the San Luis Rey River Valley and the Franciscan Mission San Luis Rey de Francia. The spiritual center is based on a Christian Mystic Philosophy and focuses on spiritual healing of its members and anyone who wishes to receive the teachings. Visitors may take meditative walks on the grounds via a map available online. The temple is historic for its combination of architectural styles: Late 19th and 20th-century revival, Mission/Spanish revival and Exotic revival. Step back in time to southern California’s agrarian roots and check out Edgemoor Farm Dairy Barn, one of the oldest still-standing farmhouses in the County and the last example of one with a Dutch gambrel roof. “The Edgemoor Farm Dairy Barn is the remaining preserved structure of a ranch and a farm that was a leader in scientific dairy stock-breeding in this country and a place that raised polo ponies for what had become the sport of millionaires,” details its Register of Historic Places entry. No other structures from that farm, which was viewed as on the cutting edge of dairy farming at the time, still stand today. That is, except for the Dutch gambrel roof barn. The National City Santa Fe Depot is the oldest surviving rail station in San Diego County and “the last surviving West Coast transcontinental terminus station in the United States.” In other words, a big deal and worth checking out its museum to learn more about this history, which is open on Saturday and Sunday from 10:00 AM-4:00 PM. The name Tecate resonates with most as a beer produced in Tecate, Mexico. But in Tecate, California, the town with a population of just over 200 is home to a site of religious importance to San Diego’s original inhabitants, the Kumeyaay people. Tecate is home to Kuchamaa, a mountain with an elevation of 3,885 feet above mean sea level which also goes by the name Tecate Peak. A landmark of the Gaslamp District, the U.S. Grant Hotel formerly served as the place to stay for people of distinction, including Albert Einstein, Charles Lindbergh, California Governors Jerry Brown and Ronald Reagan, as well as Presidents Wilson, Harding, Truman, and Kennedy. As its namesake implies, there is a connection to former President Ulysses Grant. Today, it still exists as an 11-story 5-star hotel with 270 rooms, the perfect spot for a fancy staycation. Or if you’re just looking to check out this ostentatious hotel but not spend the night, head on over to The Grant Grill for dinner or to the Grant Grill Lounge for a drink. The U.S. Grant also features an art collection valued at $6.5 million. Sitting in the heart of downtown San Diego, Spreckels Theatre was built during a key period of San Diego’s fundamental transformation into a major U.S. city in the years leading up to its hosting of the Pan-American Exposition of 1915. Construction of the Theater completed in 1912 and it seated 1,915 people to honor the then-looming Exposition. The theater draws its name from John Spreckels, the famed sugar magnate. “When completed,” explains the theater’s website, it “was the largest of its kind west of New York City and declared to be acoustically perfect.” Spreckels Theatre still has regular shows today. Check out the events calendar on its website to stay on top of forthcoming shows. Still standing today 118 years after its 1900 birth, the Hawthorne Historic Inn now serves as a boutique hotel not far from Balboa Park and the San Diego Zoo, halfway between Little Italy and Banker’s Hill. If you’re looking to check out another historic site nearby, head on over to the Spruce Street Suspension Bridge, about a mile walk away. Walking along the Embarcadeo by the San Diego Harbor and see a building which looks a lot like a City Hall? That’s the San Diego County Administrative Center, which houses the San Diego County government’s offices for many of its essential functions. Built as a public works program under President Franklin Delano Roosevelt’s New Deal, people are free to go in during San Diego County Board of Supervisors meetings held almost every Tuesday and Wednesday at 9:00 AM. In the case of FDR’s tie to his project, he actually was personally involved in its creation, which was then known as the San Diego Civic Center. The building is not just famous for all of these reasons, but also for its Guardian of Water placed in front of the building. If you’ve walked past his building in the past and not given it much thought, give it a closer look next time you’re nearby and maybe even head on inside! Most people heading down Highway 78 just a few miles east of Escondido are likely on their way to the San Diego Zoo Safari Park (aka the San Diego Wild Animal Park) and do not even notice the adjacent San Pasqual Battlefield State Historic Park. Unfortunately, most locals and visitors do not stop at the battlefield that is right next door and miss out on this great opportunity to learn about California history and experience living history programs and interpretative displays. This is, of course, a must-see San Diego attraction for history buffs interested in historic battles or the well-known historical figure, Kit Carson, but this is also an educational opportunity to learn about the history of the San Pasqual Valley, the Native Americans who once called this valley home and the journey to California becoming a state. The park looks over the battlefield where U.S. soldiers and Californios fought what is considered the most controversial battle in the Mexican-American War, as well as the bloodiest. Brigadier General Stephen Watts Kearny and just over 100 soldiers from the Army of the West were on their way to join American forces in San Diego when they were met in the San Pasqual Valley by Californios Major Andres Pico and his men. On December 6, 1846, after receiving word of Pico’s troops camped nearby, Kearny and his soldiers descended the hill towards Pico’s encampment at the Native American village of San Pasqual. They were met by Pico’s men, who had been made aware of the coming troops by a noisy reconnaissance group sent by Kearny the night before. The Battle of San Pasqual ensued. U.S. forces experienced heavier losses than the Californios, but both sides declared victory, although most reports show that Kearny and his men had only continued as far as Mule Hill before they were attacked by the Californios again. There, they spent days under siege until additional U.S. troops arrived and caused the Californios to retreat. This battle is deemed significant not so much for its importance in the acquisition of California from Mexico, but for the gallantry on both sides of the fight. It is also of significance because of the involvement of three factions: U.S. forces, Californios and Native Americans. Overlooking the battlefield, you will now find a park, museum, monument, bookstore, visitor center, amphitheater and nature trail. Visitors to the park have the opportunity to watch a video about the Mexican-American War, view interpretative displays and a map of the battle, and visit the bookstore to brush up on their knowledge of California’s history and people. There are also several picnic tables for resting or enjoying lunch between activities. One of the biggest draws for outdoor enthusiasts is the Battlefield Monument Trail, which can be accessed behind the visitor center and offers a great view of the San Pasqual Valley to those who make the .5-mile trek. Before you head out on this hike, be sure to stop by the visitor center to pick up a handout with information about the native plants you will see along the way. For those most interested in the educational value of this historic site, it is best to visit the park during one the Living History Events, which take place the first Sunday of each month between October and June. You should also make sure to add San Pasqual Battle Day to your list of Escondido things to do. This annual event takes place in December and includes a battle reenactment, demonstrations of period crafts, entertainment, food, children’s activities and a military encampment. The Las Flores Adobe was built in 1864 and is considered a perfect example of a 19th century Monterey Colonial style home—a Spanish-Mexican adobe with elements of New England frame architecture. It’s located just inside the Las Pulgas gate entrance to Camp Pendleton. Formerly listed on the National Park Service’s list of most endangered National Historic Landmarks, the adobe is currently undergoing a restoration. 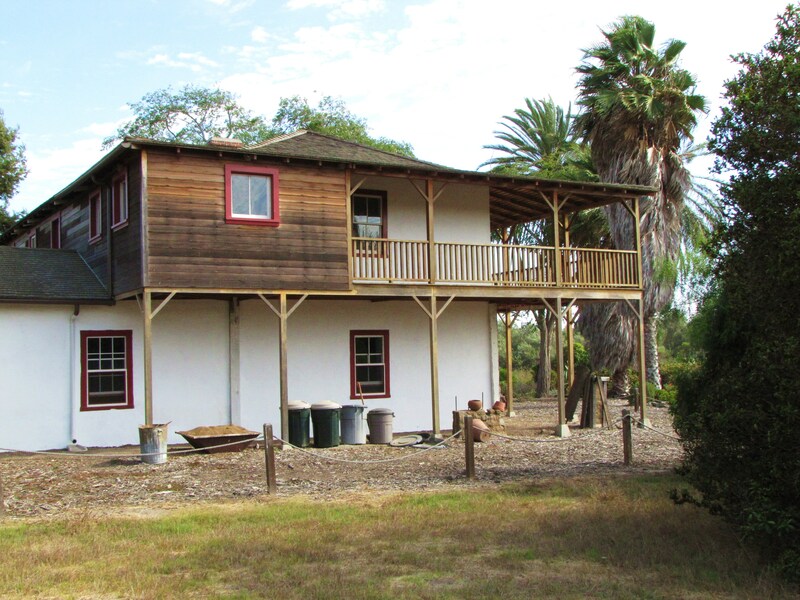 Contact the Camp Pendleton Historical Society for tours of the Las Flores Adobe. The site is also available for camping, meetings and some events. Hotel Cortez, which opened for business in 1927, can’t be missed if you’re driving on the 805 or along Park Boulevard by Balboa Park. The “El Cortez” sign glows at night and stands out during the day at 15 stories high. But it’s not actually a hotel any longer, but rather a condominium complex, with what was the Hotel Cortez historically preserved and now known as El Cortez Condos. “Very little is known about the early history of the El Cortez. From all accounts, however, the hotel gained popularity with San Diegans and quickly established itself as the social center for San Diego. 27 Despite the fact that the Depression gripped San Diego during the early 1930s, the El Cortez continued to host special engagements,” explains the entry on the National Register of Historic Places website. Beyond an iconic sign in the sky, El Cortez is also known for a great 360-degree view from its 14th floor skyroom. It also, perhaps most fascinatingly of all, served as a military installation for the U.S. military during World War Two. This one isn’t on any historic registry, but it should be! La Paloma Theatre is the definition of a hidden gem for San Diego County residents and those visiting as tourists from out of the area. Single-screen theaters are almost a thing of the past, with the only one left standing in San Diego County being the Ken Theater. And that one nearly closed in 2014. Not only is La Paloma Theatre a historic hidden gem, opening for business in 1928, it plays great independent films with daily screenings and is located in the heart of downtown Encinitas, just steps away from a slew of great bars and restaurants. You will not regret day or night out at the movies at La Paloma. German-speaking immigrants built the Olivenhain Town Meeting Hall in 1894 with the goal of maintaining a close knit colony. It was used for community functions including political meetings, agricultural discussions, weddings, and community dances. Its rustic charm still make it a popular choice for local events. It was only in 1986 that the colony became a part of the City of Encinitas. The Town Council is still active and in charge of maintaining the Olivenhain Town Meeting Hall as well as making sure that the voices of residents are heard at Encinitas city council meetings. Residents and elected officials in Escondido are dedicated to preserving the city’s rich history and heritage, including the designation of historic homes that date back to before the city was incorporated. As part of Escondido’s efforts to preserve this heritage, the Old Escondido Historic District was established in 1989. The City of Escondido was established in 1886, incorporated in 1888 and had just 541 residents as of 1890. In the years prior to and after Escondido officially becoming a city, hundreds of homes were built to accommodate its growing population. The area that is now known as the Old Escondido Historic District was the first neighborhood in the city, and many of the original homes are still standing today. Today, this neighborhood makes for an excellent weekend outing where locals and visitors can take a walking or driving tour of the community to see the 900 homes that date back to the mid 1880s. From elegant Victorians to stately Craftsman bungalows, this North County attraction offers a peek into the area’s history and draws history buffs, architecture enthusiasts and folks who simply like to see old homes that have been lovingly preserved or restored. If you plan on driving or walking through the neighborhood to view the homes, it helps to know that the Old Escondido Historic District is bordered by 5th Avenue to the north, Chestnut to the East, 13th Avenue to the south and Escondido Boulevard to the west. Its close proximity to historic downtown Escondido makes this a great, family-friendly way to spend a weekend outdoors exploring these two important areas in Escondido history. 1. The Howell House, which is the only second empire home left in Escondido. 2. The Mayor’s House, which has been home to many Escondido mayors. 3. The Thomas-Turrentine House, which was built in 1887 by the co-founder of the Escondido Land and Town Company. 4. The Wood House, which was built in 1913 by John Lloyd Wright. 5. The Bradbury House, which is a Dutch Colonial Revival home built in 1905. 6. The Beach House, which is a Queen Anne Victorian constructed in 1896. If you would like to sneak a peek inside the homes in this neighborhood, you will definitely want to take part in the Annual Mother’s Day Home Tour and Tea in the Garden event that happens each year in the district. During this annual event, select homes are open for visitors to explore. Other events also take place throughout the year, such as the Old Escondido Talent Show and the Trash to Treasures Rummage Sale. Homes in this neighborhood are privately owned, so be sure to respect the owners’ privacy and property when touring the community. Some very cool homes in this neighborhood do come up for sale from time to time, so if you would like to become a part of this close-knit community and live in one of Escondido’s historic homes, keep an eye on the real estate market. Keep in mind that part of the reason the homes in this community are so well preserved is a dedicated adherence to design guidelines and a few regulations, so even painting the exterior of your home would require obtaining a Certificate of Appropriateness. The folks who call this neighborhood home are happy to abide by these guidelines to help preserve the unique heritage of the community and make sure it is both a great place to live and a great place to tour! To learn more about the Old Escondido Historic District and coming events, you can visit the website of the non-profit Old Escondido Historic District organization or their Facebook page.